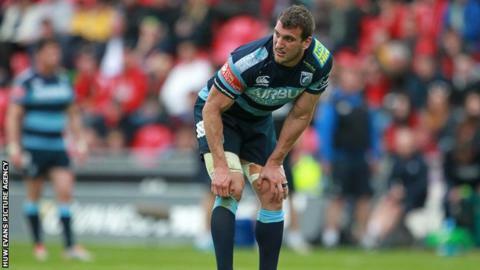 Wales and Cardiff Blues captain Sam Warburton hopes the region's new head coach will help stabilise the Arms Park side. Blues will hold interviews for the vacant head coach role at the end of the Pro12 season. Dale McIntosh and Paul John have been in temporary charge since Mark Hammett left in February and Warburton admits stability is needed. "It has been a little bit unstable the last few years," said the flanker. With one match to go, Blues will finish 10th in the table with only the two Italian sides Treviso and Zebre below them. Blues will speak to candidates in the week beginning 18 May. Their final game of the Pro12 campaign is at home to Zebre two days earlier. Warburton, 27, admits that it will take time to turn their on-field fortunes around. "I think that we all realise now, the players, the board, management, everyone, that it's got to be a long-term vision," he said. "The head coach that comes in, whoever that's going to be, will have three years which will bring some stability for him and that's what we need. "We want to be achieving. Realistically next season we just want to stabilise, do a bit better than we did this year and keep improving. "We are a group of good players and we know that we are going to be together three years and that's what we need. "So it's a long-term vision. Things are not going to happen by next week or next season. I'm in it for the long haul anyway, so bring it on."